Prepare for unparalleled scenery on this once in a lifetime visit to Ireland! This unmissable grand tour of the Emerald Isle takes in Killarney and the Ring of Kerry, Galway, Sligo, Donegal, the Antrim Coast and the Giants Causeway before finishing in Belfast. Overnight hotel, Dublin: Good standard hotel, outskirts of Dublin. Killarney Towers Hotel Situated in the centre of Killarney, our hotel has recently been refurbished to four star standard and offers modern facilities, a restaurant, bar and leisure club with indoor heated swimming pool, gym, steam room, sauna and whirlpool.All bedrooms are en-suite and have a TV, telephone, hairdryer and tea/coffee making facilities. THIS HOTEL HAS A LIFT. Clanree Hotel, Leterkenny - Our four-star hotel is well known for its Irish hospitality and offers a restaurant, bar, terrace and leisure facilities including a swimming pool, sauna, steam room, hot tub and gym. All bedrooms are en-suite with satellite TV and tea/coffee making facilities. This hotel has a lift. Situated four miles from the city of Belfast in a quiet area, overlooking the landscaped gardens of Stormont Castle, this 4 star hotel is modern and friendly and offers a high level of service. There is a restaurant, spacious lounge area and cocktail area. WiFi is available. All bedrooms are en-suite and have TV, trouser press and hairdryer, telephone and tea/coffee making facilities. THIS HOTEL HAS A LIFT. Day one takes us across the Irish Sea from Holyhead to Dublin, checking into our overnight accommodation for 1 night. Irish National Stud & Japanese Gardens - After breakfast we travel to County Kildare and have included entrance to Irish National Stud, a state-run farm dedicated to improving the quality of bloodstock. Contained within the grounds are the Japanese Gardens which were established in 1900. The gardens represent "the Life of Man" from cradle to grave and are acclaimed as the finest example of their kind in Europe. This evening we check into Killarney Towers Hotel for 3 nights. Killarney & Jaunting Car Ride - Enjoy a day exploring Killarney, set in the Irish Lake District and internationally renowned for its scenic beauty. 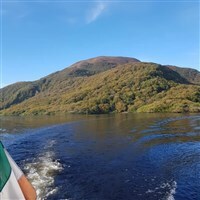 We have included a unique Jaunting Car ride (Horse and Carriage) and a tranquil cruise on Lough Leane, a memorable way to view the surrounding mountains. - Marvel at 100 miles of spectacular scenery on today's full day excursion touring the Ring of Kerry. Enjoy views of white sandy beaches, dramatic mountain passes and charming villages as we journey along the rugged coastline. Be sure to have your cameras at the ready! Bunratty Castle & Folk Park - After departing our hotel in Killarney we travel to Bunratty Castle. Restored in 1960, Bunratty is Ireland's most complete medieval castle and is home to the Lord Gort collection of furniture and artwork. Spend time exploring the charming Folk Village before we continue north to Galway and check into the Menlo Park Hotel for 2 nights. - Sit back and relax as we begin the day with guided tour of Galway City. Enjoy some free time to browse the attractions at your own pace before this afternoon we indulge in a lovely lake cruise abroad the Corrib Princess, including a full commentary and tea/coffee and scones. Sligo, Bundoran & Letterkenny - Today we depart Galway and make our way north, enjoying the coastal scenery and stopping in the towns of Sligo and Bundoran en route. We continue to Letterkenny and check in to the four-star Clanree Hotel for a 2-night stay. Slieve League & Donegal - Another highlight of our tour awaits with a trip up to the viewpoint on Slieve League to see these incredible sea cliffs reaching 2000ft above the Atlantic, a truly wild and wonderful sight! From here we make our way to delightful Donegal, with ample time to explore the town and an included scenic cruise round Donegal Bay! - We travel across the border into Northern Island and visit the mighty Giants Causeway! Discover the fascinating history and romantic legends of these amazing stones before we continue along the Antrim Coast Road, passing the beautiful landscapes centred around the nine Glens of Antrim, and finally reach the Stormont Hotel in Belfast, checking in for a 2-night stay. - Soak up the vibrant city of Belfast this morning before we visit the Titanic Belfast Visitor Centre, including tickets to see the SS Nomadic, a former tender of the White Star Line on display at the visitor centre. This iconic attraction is in the heart of the city beside the slipways where RMS Titanic was built, allowing visitors to re-live the entire Titanic story from her birth. We return to the hotel for our final dinner this evening, and the following morning make our way to Belfast port for our return crossing to Cairnryan and home.